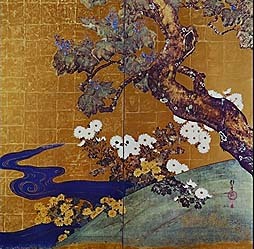 Heian Period Japan is known as the Golden Age of Japanese history because of the major import and further development of Chinese ideas in art, architecture, literature, and ritual that occurred at this time and led to a new and ultimately unique Japanese culture. The political structure, dominated by the Fujiwara family and the shoen estates, provided extended peace allowing for the growth of a leisure class of nobles. These nobles, known as kuge, had the time and the resources to establish this new Japanese culture, as they grew increasingly isolated from politics. Living in the court at Kyoto, the lives of these nobles were dominated by rituals, arts, and trends. This paper will explore the court life in Kyoto and the impact it had on Japanese culture. During the Nara Period (710-784) Japan became increasingly more intrigued by the political structure and cultural advancements of T’ang China and began using China as a model. Buddhism in particular grew in power and prestige and started having much influence over the government. The climax of Buddhist power in politics occurred when a Buddhist monk, Dokyo, was given the position of In, a position of great influence and wealth usually reserved for a retired emperor. When Empress Koken took Dokyo as her lover, the court saw that he was only a step away from the throne. To prevent this Buddhist power, the court rebelled and established itself in a new city, Kyoto (794). For about a century, emperors such as Kammu held onto and centralized power in Kyoto. After a series of weak emperors, the Fujiwara family began to execute actual control of the state, acting as regents for the emperor. Around the same time, new feudalist-like states, shoen, began appearing, allowing the rich aristocrats to leave their estates in the hands of estate managers and move to Kyoto. The aristocrats would get shiki, a sum of the estate’s profit sent to them as they lived a life of luxury in Kyoto. The stability provided by the Fujiwara’s enabled the emperor and the aristocrats to form a new leisure class of courtiers with no real political responsibilities. Some Japanese scholars continued to study in China and bring back T’ang ideas as a way to “civilize Japan” until the end of the 9th century when the T’ang started to fall. The court used this as an opportunity to incorporate what they had learned from China and expand it into a uniquely Japanese culture. The Heian Period (794-1185) is known as the Golden Age of Japan as a result of all of the cultural developments that occurred at this time. Court life during the Heian Period consisted of a never-ending series of obligatory festivals, rituals, and practices. Two-thirds the year was devoted to either Shinto or Buddhist religious ceremonies (Dilts 84). For men, most of the remaining time was spent at court entertaining the Emperor and Emperess, playing games such as kemari football, joining in bugaku dances, and participating in poetry contests or horse races (Hempel 170). Rituals involving superstition also added to the demands on their time: obsessive hygiene, intense rituals to negate the repercussions of a bad dream and forget further nightmares, and procedures for dealing with the uncleanliness associated with death or menstruation are examples of this. In the little remaining time he had, a male member of the kuge might court women, write poetry, or paint on his own. It was expected that he would be well versed in Chinese writings and familiar with minute details of T’ang court life, which he would learn at either the imperial university, study in China itself, or a school of his own clan. Though a valued member of society, the life of kuge women during the Heian was much more confined than the life of kuge men. A Woman spent the majority of her life watching rather than participating. She would stay hidden behind a silk screen and under many layers of silk clothing, her face covered with thick makeup (artificial eyebrows and blackened teeth were the trend of the time) and behind a fan. Except for occasional excursions and the necessary ceremonies, she was not supposed to see anyone besides her female attendants, husband, and father. However, promiscuity was an accepted part of the culture of these women and love affairs were expected. The affairs, the promiscuity, and the exchanging of poetry between lovers provided much excitement in the life of the kuge. Personal relationships were dramatized in a most extravagant way; both men and women spent incredible amounts of time strategizing how to win a lover and evaluating the significance of his or her lover’s actions. For men isolated from politics and business these affairs offered excitement. “With every detail of everyday life as carefully prescribed as it was in the late Heian, no courtier presumed to be spontaneous or original; court ladies offered his only chance of adventure” (Dilts 91). In a society extremely preoccupied with rank, marriages (or becoming a concubine for the lower classes) offered women a way to move up in society and to make important social ties for their family. For this reason courtiers actually preferred having daughters rather than sons. When she was not engaging in a love affair, a woman kuge might be found making clothing. Not only would a Heian woman and her attendants need to provide clothing for herself and her family, but she would also need to provide clothing to be given as gifts in ceremonies such as the New Year Celebration. Keeping up with the incredible trends in clothing at this time meant the women spent considerable time making clothing. However, there was still much time for the women to be educated. They were educated and expected to know how to write artful 31 syllable waka poems in a “women’s calligraphy” style (Hempel 170), but this was not the only writing they did. 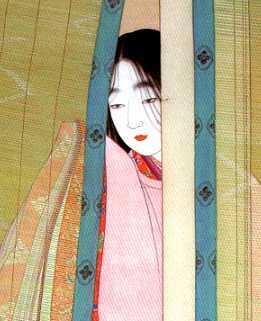 In her Pillow Book, Sei Shonagon used a less formal, more conversational type of writing unique to women. The Pillow Book, a diary/thought book is one of the best resources into the lives of kuge women. In it she talks about her disdain for the lower classes, adoration of the empresses and emperor, events she has “spied” between people, things she finds entertaining (backgammon, babies, lovers), things she finds boring or without merit (rain, abstinence), to name a few. Another book written by a woman, Murasaki Shikibu-nikki, (approximately the year 1000), The Tale of Genji, was the world’s first psychological novel, starring the love life of Prince Gengi. Much subsequent art and many poems would be based on this novel, which became the most celebrated novel of Japan. Though the court was dictated by much pomp and circumstance and was effectively useless politically, they made very important contributions to the uniquely Japanese culture that was to appear during this time. One of the most important contributions was the determination of a 47 character phonetic alphabet based on the Chinese symbols that sounded most like their own language. Though scholars and courtiers displayed their education by flaunting Chinese writing, this Japanese writing was used by the women in such books as the Pillow Book and the Tale of Genji as well as other poems and diaries of the time. Another cultural development, a new style of painting, Yamato-e, basically illustrated narratives featuring Japanese people in Japanese settings, developed at this time. Also at this time, sculptures of Buddha became more “Japanese looking,” with a rounder face and more slanted eyes. Though Buddhism did not play a direct role in politics as it had at the end of the Nara Period, Buddhism was still a very major part of the daily lives of the kuge. Different sects of Buddhism contributed to the superstition and mysticism of this time period. For example, in the Tendai doctrine believed that simply reciting the name namu Amida Butsu throughout the day Amida, the Lord of the “Western Paradise” would ensure the believer admittance into the Western Paradise (Hempel 72). Other sects promised fulfillment of every human desire by performing specific rituals (Dilts 69). The kuge would make huge contributions to the Buddhist temples for the mysterious services they provided. Thus, Buddhism also occupied the kuge’s time with even more superstitious rituals than the mandatory Buddhist ceremonies. Perhaps the most important new value added at this time was miyabi, which means something like beauty and the ability to appreciate beauty. “More than anything else, miyabi refers to sedate pleasures that an upper class person takes in small things, such as flowers or falling leaves. It becomes apparent that miyabi , as a cultural value, is in its origins a way of distinguishing the upper class from the lower class” (wsu.edu). Miyabi also refers to personal refinement—good taste and good manners. These manners also set apart the upper class and included things such as proper procedures for gift giving or being a host at an elaborate feast where presentation was much more important than the quality of food. The kuge at this time were obsessed with following the proper procedures and making a good impression on others, creating a very superficial society. As mentioned earlier, in Heian society rank was everything. At the center of everything and adored by all the court were the emperor and the royal family, while those in lower ranks were looked at with a certain disdain. Much time and many gifts were given to try to impress and gain the favor of the emperor or others in higher rank. As a result, there was a certain "psyche of the importance of appearance over reality." The miyabi value established in the Heian court effects the mannerisms of the present Japanese. Gift giving, greetings, and table manners are highly formalized, and there remains an incredible emphasis on presentation in all these scenarios. The sense of “appearance over reality” and reserved politeness originating in the Heian court still contributes to the Japanese psyche of today. The keen aesthetic sensibility that flourished in the Heian court as Shinto and Buddhism combined is still a major part of the culture today. Modern Japanese still appreciate and reflect on natural beauty and will travel long distances to “feast their eyes on a particular variety of plum tree that blossoms in the winter” (Christopher 151). Christopher, Robert C. The Japanese Mind. New York: Fawcett Columbine, 1984. Dilts, Marion. Pagent of Japanese History. New York: Longmans, Greens and Co., Inc, 1961. Hempel, Rose. The Golden Age of Japan 794-1192, New York: Rizzoli, 1983. Leonard, Jonathan Norton Early Japan, New York: Time Life Books, 1968. Sei Shonagon, translated by Ivan Morris. The Pillow Book of Sei Shonagon, New York: University Press, 1967. Tsunoda, Bary, and Keene. Sources of Japanese Tradition, New York: Columbia University Press, 1958. Good succinct article with main focus being court life. Interesting websites focusing on women and aesthetics in Heian Japan. Good summary of Heian Period. Offers interesting insights into the customs of Japan today. Excellent website with great links. Be sure to check out the miyabi link!